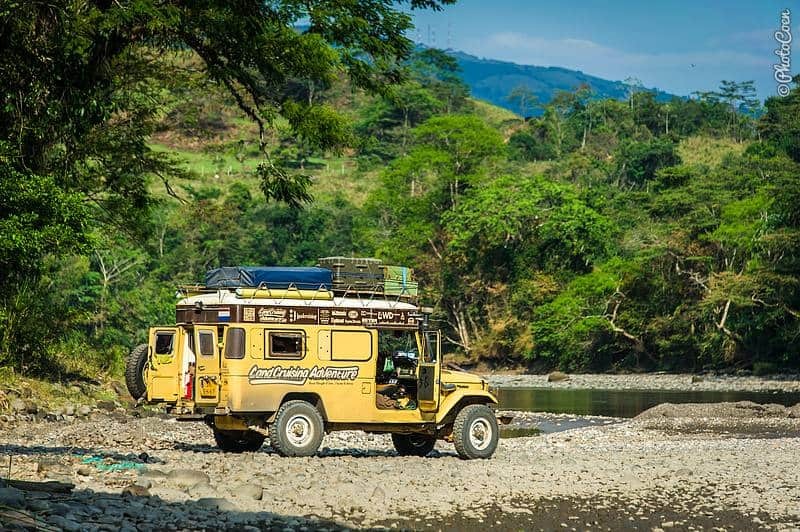 In Colombia we a variety of places that were perfect to camp with our overland vehicle. Some were beautiful, some convenient. 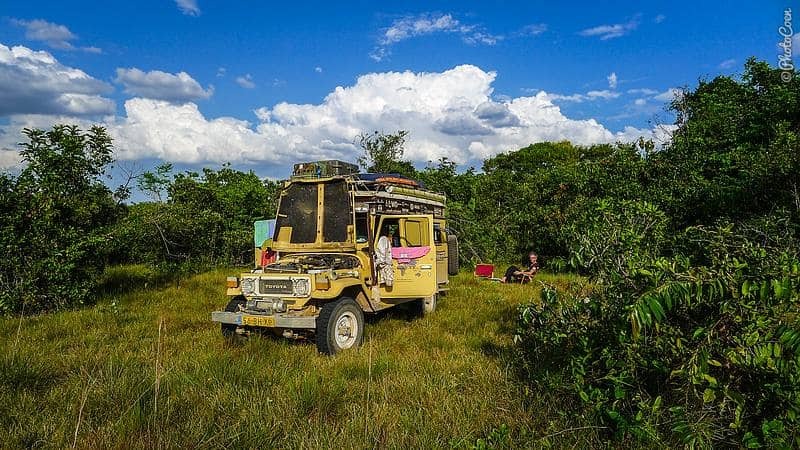 In the Tatacoa Desert – the best so far. Along the side of the road, asking owners for permission to park in their driveway. In a garden of friends’ places. Rough Camp between Landazúri and Embalsa de las Playas. We camped here for a couple of weeks. It looks like as we’re not enjoying but we were! Great workshop, which we recommend. 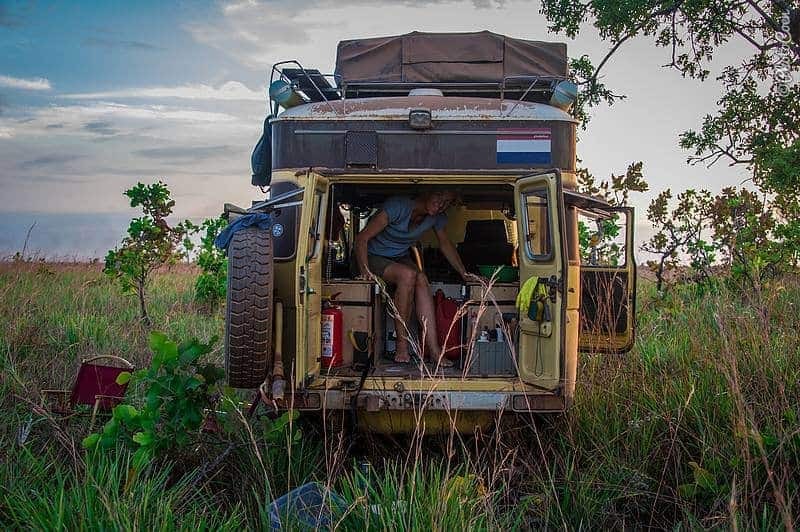 Rough Camp in Los Llanos. 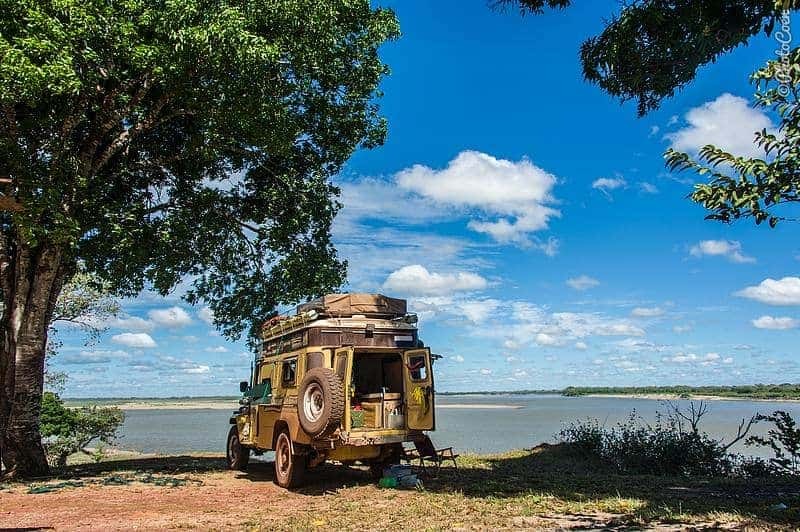 Camping in the middle of the plains of Los Llanos. A woman in La Venturosa let us camp on her terrain under a huge mango tree with this fabulous view! Note that sometimes we write ‘drinking water from the tap’. This means we drank that water because locals told us it was safe and we didn’t get sick from it. Things change, including quality of water, so always ask local people if the water is still safe to drink. Mocoa, Hostal Casa del Rio. Camped in the nice green garden. Very quiet and peaceful place. Use of toilet and outdoor, cold shower. Use of kitchen and good WIFI. $7,000 pp/pn. Good base for hikes in the surrounding areas. Owned by Philip, a Belgium guy, but he is selling the place so maybe things will change in the nearby future (526 mtrs, Nov' 14). San Agustín, Archaeological Park. We camped in the parking lot in front of the entrance. Quiet night. Could use the bathroom in the park (right behind the entrance) (1775 mtrs, Nov '14). San Agustín, Hostel Anacoana. We camped in the parking lot of this very scenic hostel with beautiful garden and views of the valley. Incredibly friendly owner, you can pay him whatever you think your stay is worth. You can sit in the restaurant to use WIFI and drink coffee as much as you want. 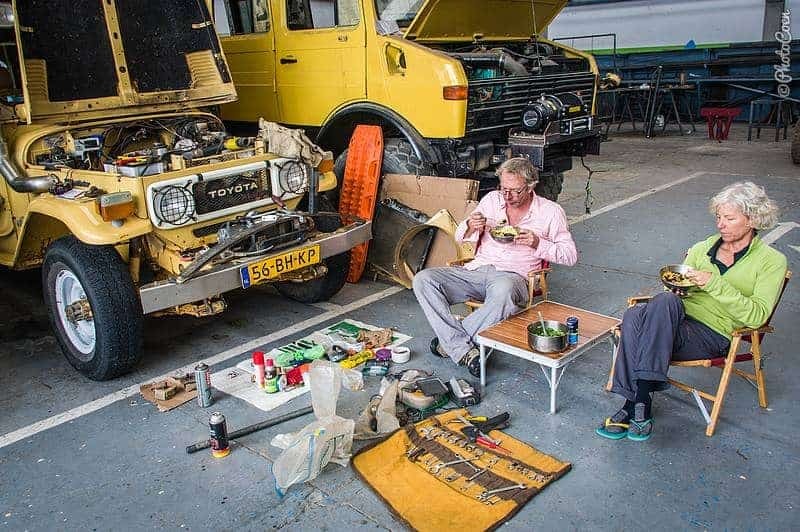 Hector, the owner, also helped Coen finding a good mechanic when the Land Cruiser's start engine failed (Nov '14). Agua Hirviendo (south of Popayán). Some 30 kms south of Popayán, on the road to/from San Agustín are two thermal baths. 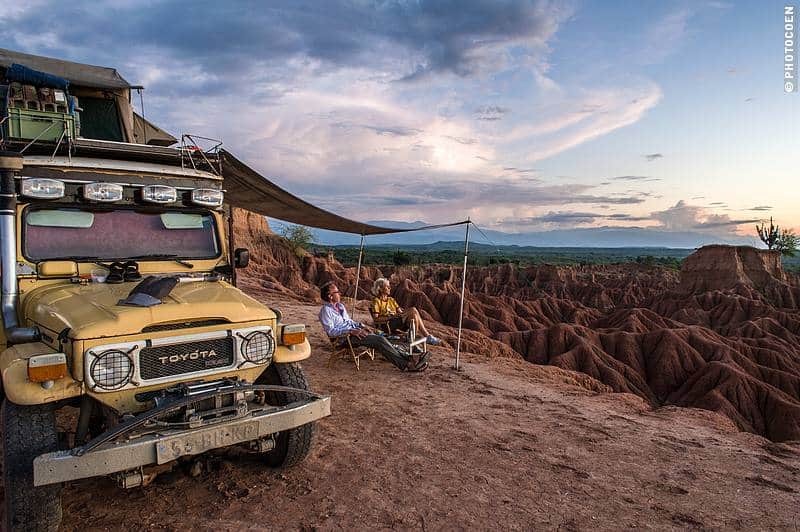 The first we tried, Agua Tíbia wanted us to pay the entrance fee of $12,000 pp even though we didn't want to use the thermal bath + an additional $30,000 to spend the night. Crazy! So we drove to Agua Hirviendo, where we could camp in the parking lot free of charge and use the toilet of the thermal bath. We did use the thermal bath as well, worth the entrance fee of $6000 pp. We had a quiet night but it may be party time on Saturday as on that night the pools are open all night long. (2628 mtrs, Nov '14). Popayán, next to the Bomberos (fire station). We spent two quiet nights in the street next to the fire station (a Saturday and Sunday night, so quite a wonder it was silent at night!). We could use the toilets of the restaurant and a hotel on the other side of the street. We filled up our drinking water at the fire station as they said they drink the tap water. Popayán, north of town in the parking lot of Restaurant El Rancho Argentino (next to Esso Gas Station). Super friendly owner Victor Mendez. You can stay free of charge, use the toilet, and the restaurant has excellent WIFI. No drinking water (1870 mtrs, Nov '14). Silvia, dead-end street. Near the entrance of town we camped at the end of a dead-end street. Quiet place. (2463 mtrs, Nov '14). Cali, Parque Agua de la Caña. You'll have to ask for the owner, Diego, to get permission to stay here. Perfect place to camp. Safe, quiet and use of toilet. Free of charge (999 mtrs, Nov '14). Tierradentro. Camped at a Hostelería across from the archaeological museum (where they didn't let us camp). Paid Cop $10000. Use of toilet and shower and you can handwash your laundry (1575 mtrs, Nov '14). Drinking water from the tap. Neiva, plaza. Quiet night at a plaza with a 24/7 police station. Half a block down towards the Cultural Center is a restaurant with WIFI on your right-hand side that is open at night (450 mtrs, Nov '14). Do you have information we should add to this page? Please share it with us in the comment section below so other travelers may benefit from it. Thanks. Of course, show me the way! 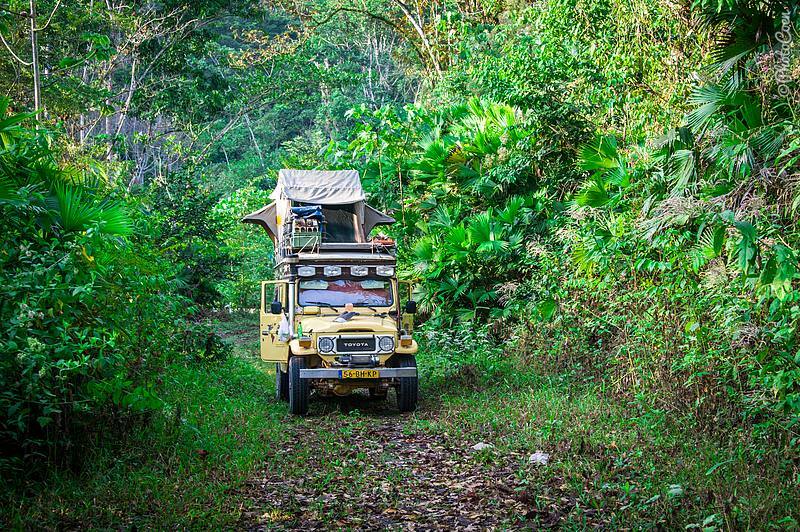 Colombia is an awesome place to visit.Really nice article.Thanks for sharing this article with us.